Sweden’s solid blackened thrash metal outfit Witchery return with In His Infernal Majesty’s Service, their sixth full-length album, and their first since 2010’s Witchkrieg. A few lineup changes have occurred in the interim,the most notable being the addition of relative newcomer Angus Norder on vocals. Rather than employing a dirty sound, Witchery are much closer to Slayer than to Aura Noir, for example, with a polished approach to their brand. For the most part, that approach pays off as Witchery are very slick with stellar production, tight musicianship, and generally good songwriting. That’s pretty much par for the course with In His Infernal Majesty’s Service with a couple of out and corkers, such as the album opener “Lavey-athan,” with its galloping pace, gigantic riffs, and fluid guitar soloing. Witchery reveal their obvious Slayer influences with riffing lifted straight from Kerry King and Jeff Hanneman on “Nosferatu,” a song that would fit right in on Divine Intervention. “Nosferatu” serves as a nice lead in to the one two punch of “The Burning Of Salem” and “Gilded Fang,” both being very fast songs that showcase Witchery at their best. Frankly, Witchery are at their best when ramping up the speed and letting the riffs fly fast and furious. A couple of songs fall flat, however, such as “Empty Tombs” with a rollicking gait that just doesn’t quite seem to fit Witchery’s semi-serious approach to their chosen subject matter, and with “Escape From Dunwich Valley,” a slower, melodic song anchored somewhat by some good guitar soloing. Barnstormers such as “Oath Breaker” and the closer, “Cloak And Dagger,” anchor the album’s second half while smartly adding moments of beefy riffs piled on top of a mid-paced tempo. 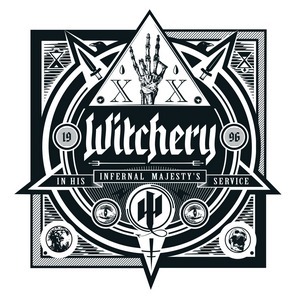 Witchery have delivered yet another solid album with In His Infernal Majesty’s Service. The album probably won’t vault Witchery out of their second tier status, but that’s probably not the point as they are on firm footing with their polished delivery of blackened thrash metal.